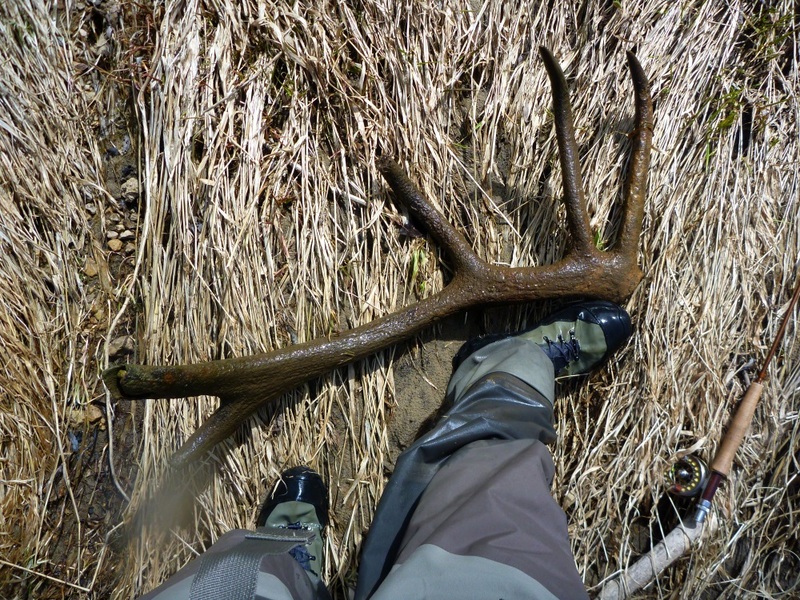 Home Fishing The Streams 4/5 & 4/9/14 Carnivores & Elk Antlers?!? 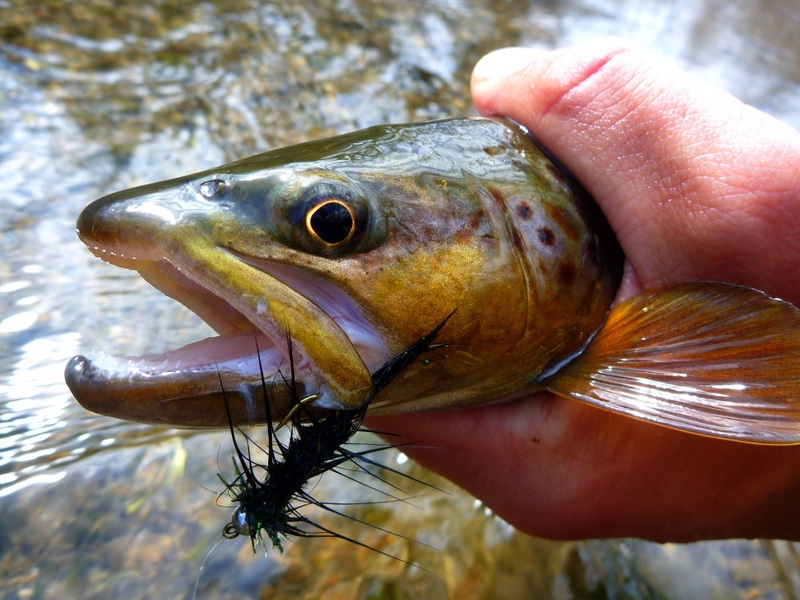 Trout are carnivores and this time of year they demonstrate that fact by chasing fat streamers to your feet despite the clear low water. These fish are hungry, period. 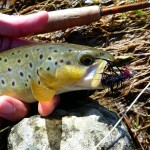 Note the below image for this post, look closely and you’ll see a brown trout holding a sucker in it’s jaws. I peered over the bank and watched this brute demolish this sucker, ripped it in half then proceeded to scoop up the remains and slink back to it’s hiding place. 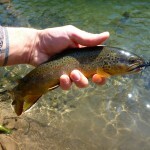 This fish was determined to eat every inch of that sucker, by my accounts the sucker was between 6-8 inches, the trout maybe 16-18? 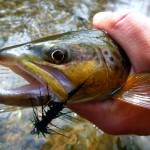 I love this time of year when the feed bag is on and trout aggressively attack and demolish a black streamer at will. Put the fly in the correct spot without spooking the pack to much and it will get a damn good look if not an unflinching strike. 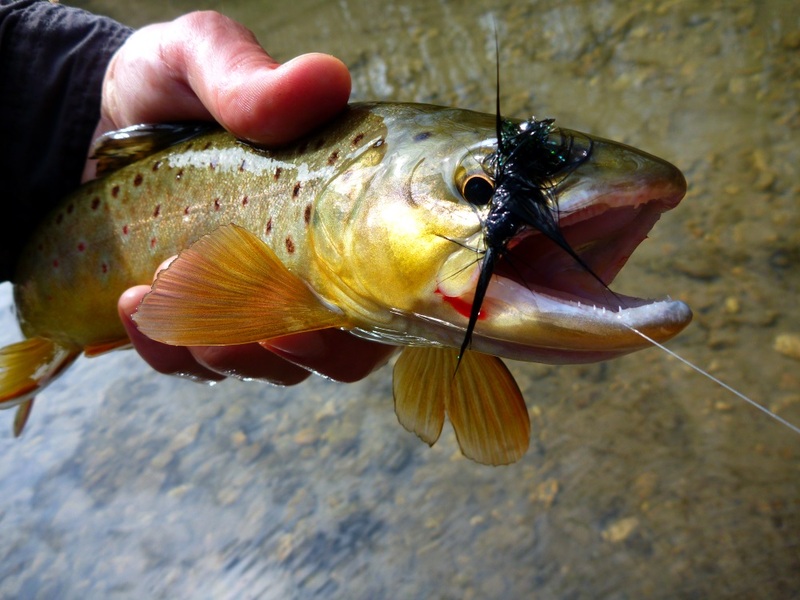 I’m a big fan of the down and in approach this time of year with my streamers, often the larger trout will hold in the best feeding locations near the head of a riffle in a spot you might think unlikely. By presenting it in faster water you force the fish to make a choice, pass the meal over or strike quickly and hard before the meal passes by. This typically results in an acrobatic display. Catching big fish is nice but I think my favorite thing is looking at a spot, knowing and not just thinking but truly knowing that there is a fish there and sticking the presentation resulting in a hooked fish. 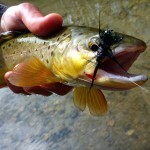 Note the image below that resulted in a nice 15inch brown holding in maybe 6inches of water coming to hand. I surmised the fish was at point X, fly was roll casted to the location of the red dot and allowed to follow the red curved line. 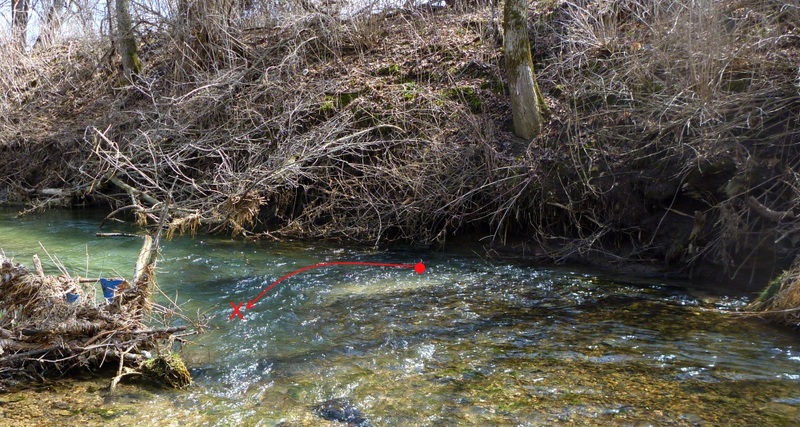 I took the picture from the exact location where I made the cast from, a simple down and across allowing the fly to swing infront of the trout I wanted. 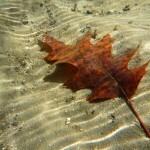 Another lesson from the two days…roll cast, roll cast, roll cast. Finally, fish everything. This time of year the fish are holding everywhere. 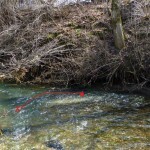 They are in the shallow riffles, in the runs, in the pocket water and in the deep holes. 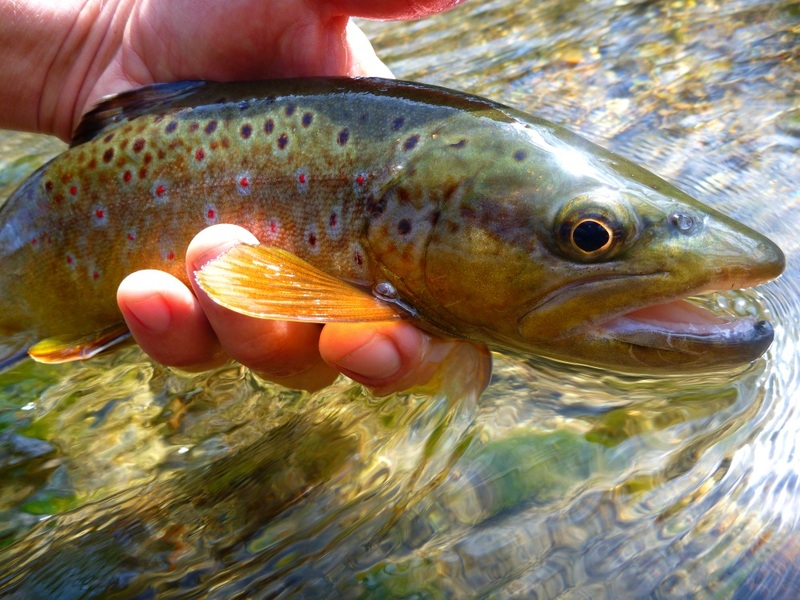 Something else to keep in mind: In order for a trout to survive and thrive past 10inches long it must begin consuming food items that are an inch in length or longer. 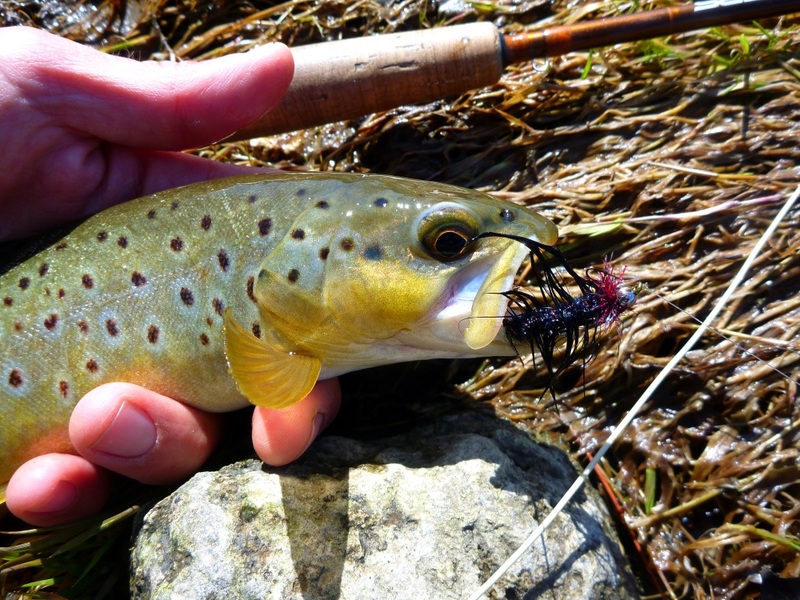 Most of my streamers are an inch to two in length, even the 6inch trout readily slam these bigger flies. 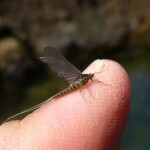 BWO’s are here and will be for a week or two, get out while you can. 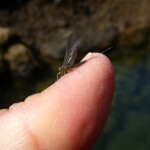 Fish a #18-20 dark olive bodied fly with a dark dun wing/hackle. 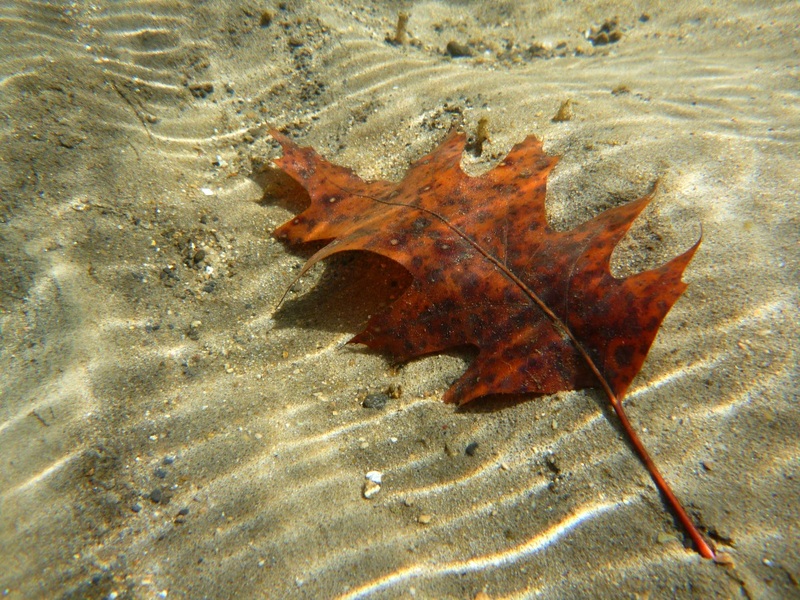 Look for water temps between 46-50degrees, most days right around the 12:30-2pm mark for the emergence to begin. 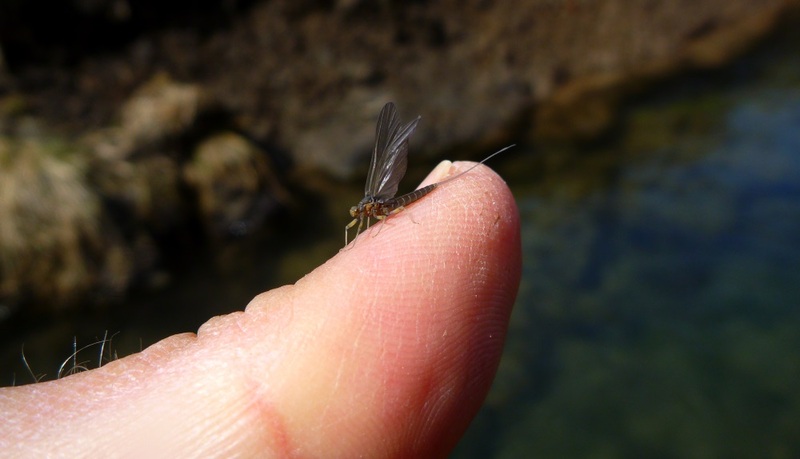 Typically the cloudy rainy days will be the most productive for these flies. 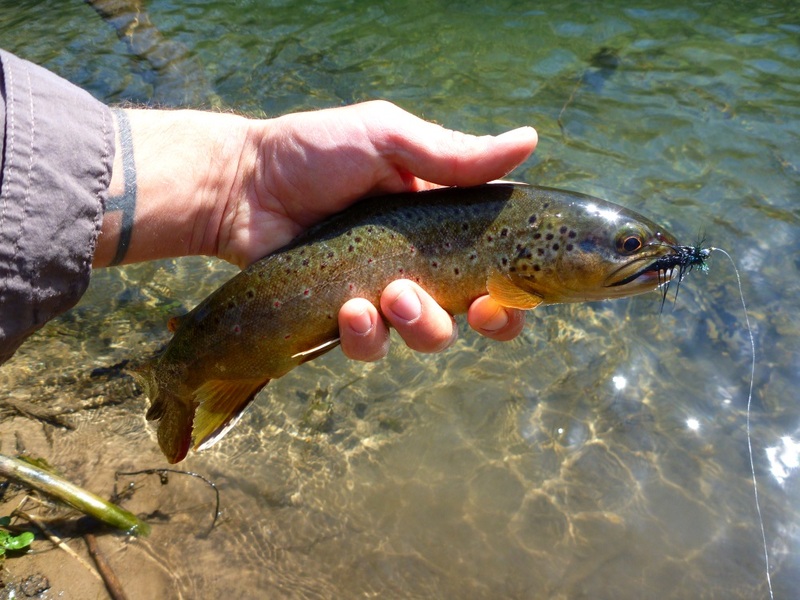 I watched one 12inch brown sit in a slow section sipping every fly that floated past. 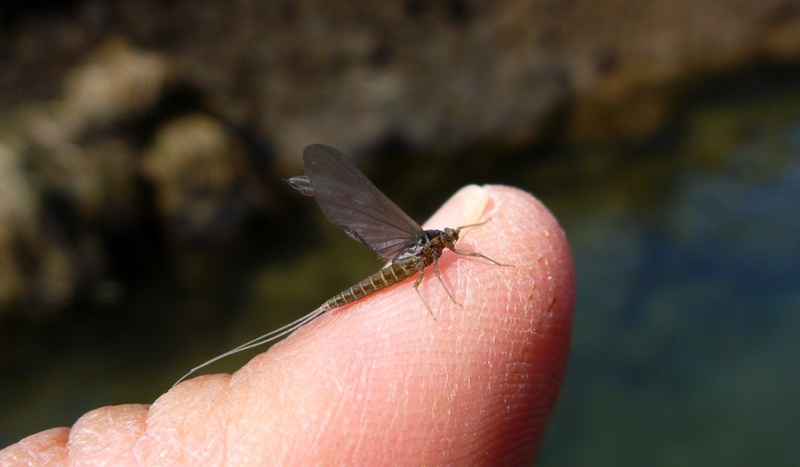 Something very cool in just sitting back and watching, I didn’t feel the need to tie a dry fly on. 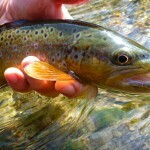 I had gotten everything I wanted from the day and enjoying the trout get one was icing on the day. 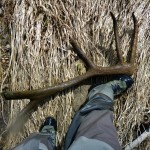 One last note: The Elk Antler? WTF… Man, I don’t know what to say about this thing. 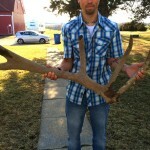 It’s massive measuring over 38inches in length and over 12inches around at it’s widest point. I saw it and almost didn’t believe my eyes at first. I held it and got this kind of eerie feeling, I had to look around and make sure I was alone. 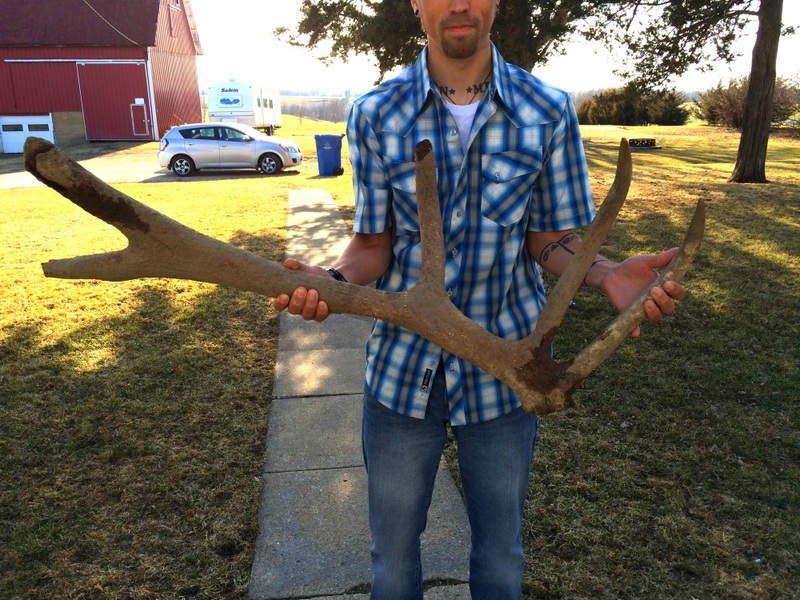 Imagine the size of animal this thing came off of…Wow. I toted it home with me where it will become part of my collection of items I’ve found while running the driftless creeks down. Some discussion has been had on local forums about this thing, perhaps it’s a VERY VERY old partially fossilized relic from when Elk ran wild in SE. Minnesota (Circa 1840…) That would be awesome to have that piece of history hanging in my barn… Perhaps the more logical explanation is that it came from a rouge escapee from an elk farm around here or a random Elk wandered way south one day? I don’t know, the verdict is still out but I will be contacting the DNR about it. An update will come when I know more. Great post here. A lot of good info. I am intensely fascinated by that encounter re sucker consumption. Would you be willing to type out exactly what happened there? I’ve always wanted to watch that go down. I envision them swallowing the fish whole. But you say it tore it apart. Would love to hear more detail. Thanks. 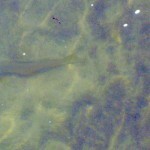 When I peered over the bank and saw that trout it was holding the fish as shown in the photo. It sat holding tight to the bottom with no other trout around. That fish sat there and shook violently back and forth and occasionally it would chew on the fish in the same spot. This continued back a forth shaking and chewing until that fish was torn in half maybe 5-8 minutes. Then it took the smaller portion and swallowed it whole. A minute or two later it took the remaining piece which was a good 3-4 inches long and crammed half of it in its mouth then slunk slowly off to the bottom of a deep hole where I couldn’t see anymore. Interesting that it was sitting in maybe 3-4feet of water the entire time I was watching in the wide open where just about any threat could have taken advantage of the situation. I did watch the trout holding the sucker chase two smaller fish off without letting go of that sucker for even a moment. It was a super cool sight to see. Glad I just watched and took it all in. Fascinating. What a sequence to observe. Thank you, I appreciate the detail provided.